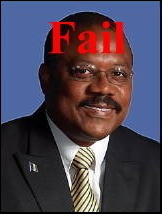 We’d like to remind Bajans that for seven eight years Transport Minister Boyce and his predecessors promised modern anti-drunk driving laws, breathalyzers and strict enforcement of traffic offences that kill our family members, friends and neighbours. None of those laws or changes happened. In 2010, Transport Minister Boyce again promised, saying we’d see breathalyzer laws in 2011. We said at that time that we didn’t believe him. We were right. Barbados 2010 road deaths 240% higher rate than U.K. – looking worse for 2011. Government response to more fatalities: Transport Minister Boyce makes same speech he made a year ago! “One of the things we have been talking about recently is the launch of our National Council for Road Safety which is a new umbrella organisation for all the road safety organisations in Barbados and being represented at the highest level of Government. Our plan is that the Prime Minister [Freundel Stuart] will chair this council or delegate to one of his ministers to do so. Minister Boyce also disclosed that Cabinet recently approved the establishment of the Barbados National Road Safety Council, which will be chaired by the Prime Minister and with the Minister of Transport and Works as deputy chairman. Meanwhile, Boyce said Barbados was vigorously pursuing objectives outlined under the United Nations General Assembly’s declaration that the years 2011 to 2020 was “The Decade for Road Safety”. Another year without modern anti-drunk driving laws, breathalyzers, pedestrian overpasses, cell phone driving ban, priority traffic law enforcement. Just about a year ago Barbados Free Press reported that Barbados road deaths happen at a 240% higher rate than the UK. You can forget that statistic because so far this year we’ve had 18 road deaths compared with 11 in the same period in 2010. That’s up 61% from last year’s already horrendous death rate. Over a year ago we wrote Barbados cell phone driving ban coming? Why we don’t believe Minister of Transport John Boyce. We were correct: it was all talk and no action. The DLP government and the BLP before it long promised pedestrian overpasses in some of the killing zones. The overpasses never came and pedestrians are still dying. For seven years Transport Minister Boyce and his predecessors also promised modern anti-drunk driving laws, breathalyzers and strict enforcement of traffic offences that kill our family members, friends and neighbours. The Colman Commission into the failure of CLF Financial and the Hindu Credit Union is just about to move into its second round of Hearings and the public can expect to have further testimony on the losses suffered by people who deposited monies with CL Financial. I have made several submissions to the Commission and have been invited to give evidence. I am reliably informed that there have been strong and unanimous objections to my participation in the Colman Commission. It would seem that only the Commission itself is interested in having my testimony go onto the record. It is not surprising to me that objections of that sort would be arising now, but readers need to have a context. The Colman Commission was established to find out how this fiasco occurred, recommend methods to stop a recurrence and also to identify responsible people who are apt for lawsuits or criminal charges. The main parties can be expected to give self-serving evidence, designed to exonerate themselves from any blame. That Annual Report was published on 23rd January 2009 – yes, that is 10 days after Duprey wrote to the Central Bank Governor for urgent financial assistance and one week before the bailout was signed on 30th January. Will TotallyBarbados.com win another World Travel Award? Our friends at Totally Barbados have just gone public with their new web design and we think it’s a winner. The look is modern and attractive, it loads quickly and the interface changes enhance what was already an exceptionally useful tool for visitors and Bajans alike. Brett Callaghan and the staff are incredible online promoters of Barbados – and that was recognized last year when TotallyBarbados.com again won the World Travel Awards “World’s Leading Travel Destination Website”. Not bad for some folks ‘pon de rock! Totally Barbados is in the running again for the 2011 awards and you can help by visiting the website and supplying your vote. Good luck to our friends at TotallyBarbados.com as they work hard to bring visitors to our shores.